Here's the deal: this is a 100% numbers-matching, documented, investment-grade, 36,806-mile 1970 Hemi 'Cuda with no baggage. But don't just take our word for it�there's an original Chrysler Corporation Broadcast Sheet and a complete Govier inspection report, with photographs, that confirms all this, too. Call us and we'll fax it to you. Stories? This 36,806-mile car has none. All the sheetmetal is original. All the glass is original. 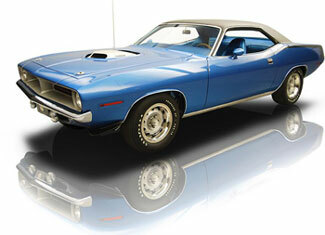 It is one of only 368 Hemis built with a TorqueFlite transmission. The high-quality restoration was finished a few years ago, and the car has seen very little use since. It was regularly detailed top and bottom and stored in a climate-controlled facility since completion. The only major deviation from the "by the book" restoration was the installation of a 4.10 gearset in place of the original 3.55s, just to make it that much more fun to drive. "Nice car" doesn't even begin to describe it. 1970 Plymouth Hemi Cuda restoration was carried out to the highest standards using all the correct components, hoses, fasteners, and clamps. Although the fender tag suggests that the expected build date was October 13, 1969, the original door VIN decal indicates that the car was actually built sometime in November 1969. As a result, all the pieces on the car are properly date-coded prior to this. The engine casting date is 5-19-69, the transmission assembly date is 10-9-69, and the engine assembly date is 10-22-69. All 7 of the critical VINs on the car match, and we have a clear copy of the original broadcast sheet to go with it. This car is the real deal.